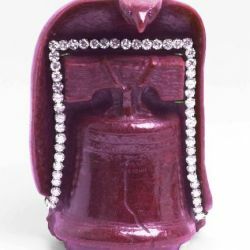 The FBI has issued an alert to be on the lookout for four suspects who stole a “one-of-a-kind” ruby sculpted into the Liberty Bell, valued at $2 million. Four thieves nabbed the 4.5 lb. gem, along with many other items, from a safe in Stuart Kingston Jewelers in Wilmington, Del., on Nov. 1. The piece hails from an 8,500 ct. piece of ruby listed in Guinness Book of World Records as the “largest uncut ruby in the world.” There were also 50 diamonds attached to it, representing the 50 states. The case was featured on last week’s America Most Wanted. He notes that the ruby isn’t gem quality, so it’s unlikely it will be recut. Anyone with information can call the FBI at 302-218-6252. This entry was posted in Jewelry and tagged Jewelry, Liberty Bell, Stolen. Bookmark the permalink.